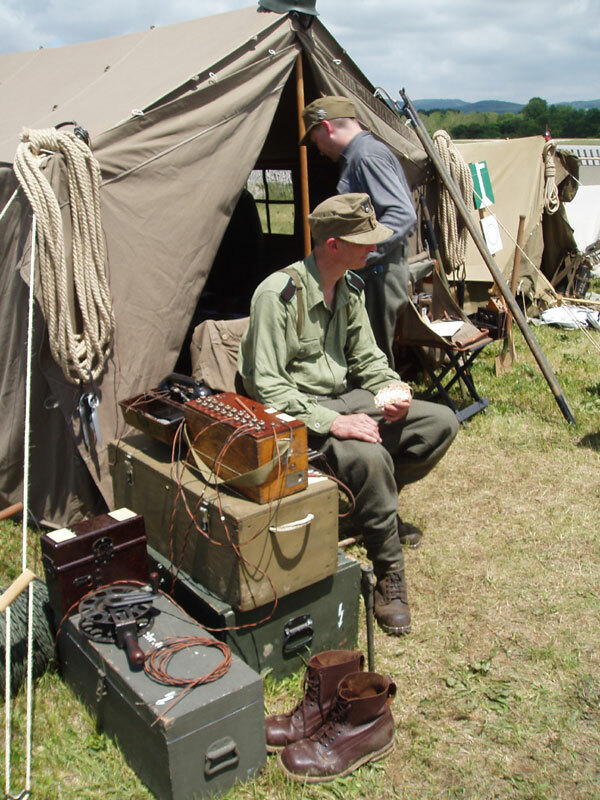 Welcome To My Wehrmacht Radio Operator Page. 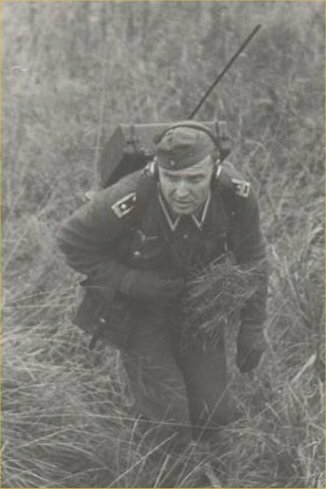 This page is a kitbash I have made based on the picture on the right, of a Wehrmacht radio operator. The picture comes from the Osprey book - The Men at Arms series 336, The German Army 1939 - 1945 (5) The Western Front, and from that book the picture is in Plate D. Note: I have asked for permission from the book publishers, to be able to use the scanned image here for my kitbash. The kitbash itself is based on the Dragon Hermann Stahlschmidt boxed figure, and the first thing I have done is I have replaced the moulded boots that came in the set. 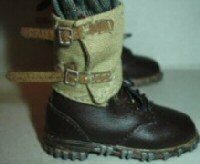 With a pair from the Toys City Mountain set that I obtained loose, I also have used a pair of cloth gaiters that I believe came from a German DiD figure. I have also used a pair of cloth gloves on the hands. Most of the other parts came from the boxed figure. 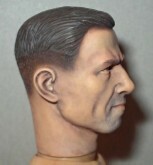 The headsculpt for this figure was again given a wash over with some Light Brown pastel chalk, to add the shadows and lowlights to the sculpt. And in the pictures below from the left, the first two pictures are of the head as it came from the box, the next two pictures are after I have given it the wash and let it dry. I then gave it a gentle wipe over with a damp tissue to remove some of the Brown colour from the raised parts of the face. The final two pictures below show the headsculpt after I have given it a drybrush of a Flesh coloured pastel chalk, this is to add some highlights to the face. Note: For this sculpt alterations I have only used the pastel chalks. and I have not given it a paint over with the Matt Medium acrylic paint first. My reason for this is that I have ruined a headsculpt recently and I could not work out what I was doing wrong. Until I had a chat with Paul (.308) and he mentioned about contaminated brushes, and it suddenly dawned on me that this was the problem. Because I was in the habit of only using maybe two or three particular favourite brushes to do this work, and if one had some residue from the paint or thinners still on it. Then when I went to use the pastel chalks, this could react and cause the problems that I have been having. So now I have separated my brushes into groups so that some are for the paint and some for the chalks. And with the result that I have got as shown above, it is proved that Paul was quite rightly correct in what he said, and I would like to thank him for the help. The uniform consists of the camouflaged smock, trousers and a loose scarf I had. The cap is one from the Dragon Alfons figure, and for this figure I also placed the Edelweiss insignia onto some repainted cotton printer paper as shown right. Note: A better explanation about how to do this is on my Gebirgsjager page. The only other parts that I have used are a pair of cloth gloves. As mentioned before I have replaced the moulded boots with a pair from the Toys City mountain set, which has had a coat of Acrylic Matt Medium applied to them to lose the shine. And as shown above left I have tied the laces as tight as I could. 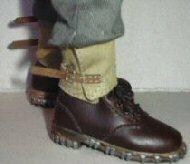 Also I have tied the trouser bottoms as tight as I can, so that all the slack has been taken up which help when I fit the gaiters. 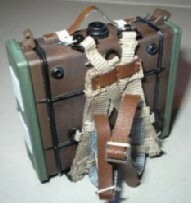 The next picture above shows the gaiter placed around the boot, which is pulled tight on the gaiter material and not by the straps. 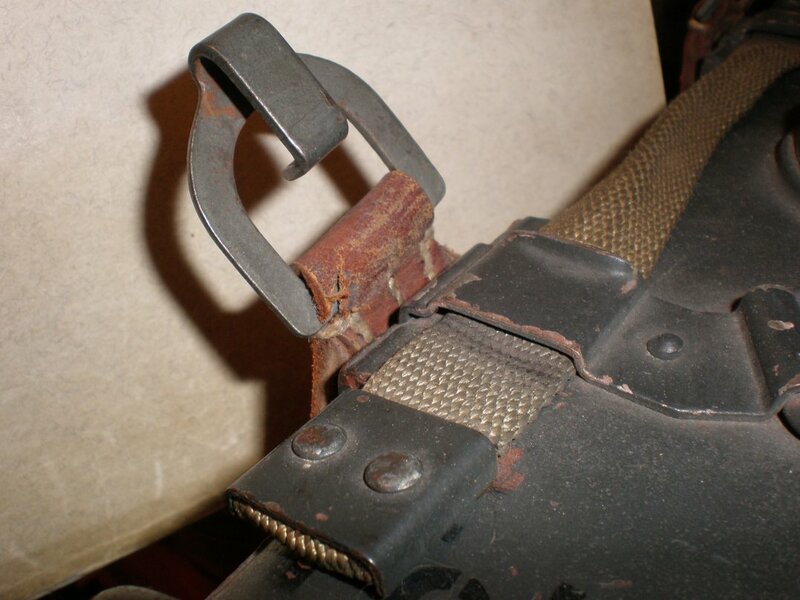 Note: Because as I have found that if you pull the straps too hard they will break. 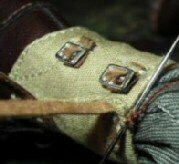 So to make sure that I can get the gaiters tight, I then pinch them together at the top and sew a couple of stitches in place, making sure that they cannot be seen from the front. 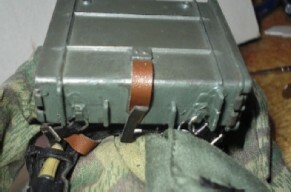 The point of doing this is that the tightness of the gaiter is held in place by the thread, and not by the fabric straps. 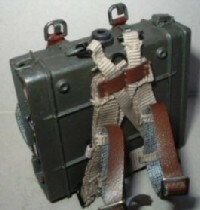 And as shown by the next picture above, I have done up the straps by making sure that I press the gaiter together at the top and bottom when I am doing this, so that there is less chance of the straps breaking. And in the picture shown above right I have bloused the trousers out over the top of the gaiters. Note: I always leave the straps long as shown, just in case I have to remove the gaiters for any reason and I usually cut these shorter after I have finished the figure. 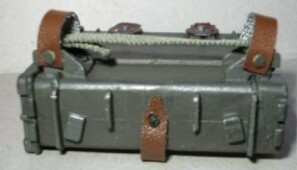 The two pieces of radio equipment that came with this figure are to be used separately, and not as I mistakenly thought that they were combined together to make one radio unit. Because after asking Patrick (Heersbergfuhrer) about this figure, he has been very helpful in explaining to me about these radio sets. 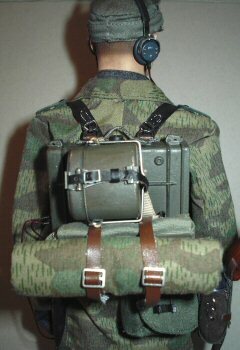 With my figure here I am using just the backpack section as this is called a Feldfunksprecher.b radio unit. 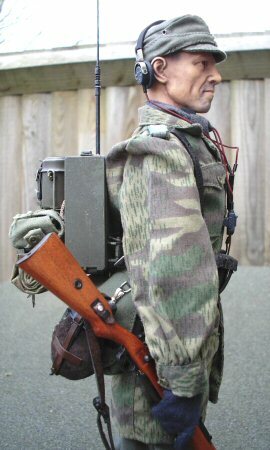 And two links to show what the unit is are here - Backpack Radio and also here - Backpack Radio. 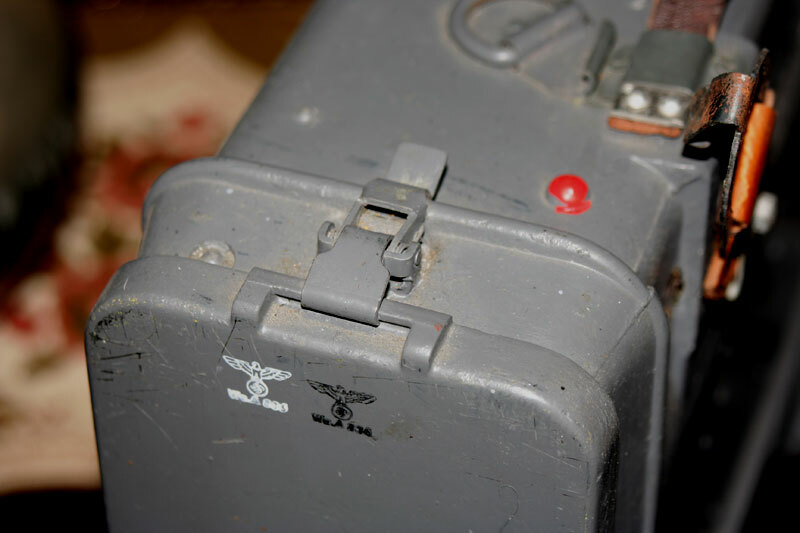 The other unit that came supplied with the figure is a Feldfernsprecher 33 which is a separate telephone unit which is normally plugged into a larger switchboard unit for something like headquarters use, which is shown in the pictures on the right. 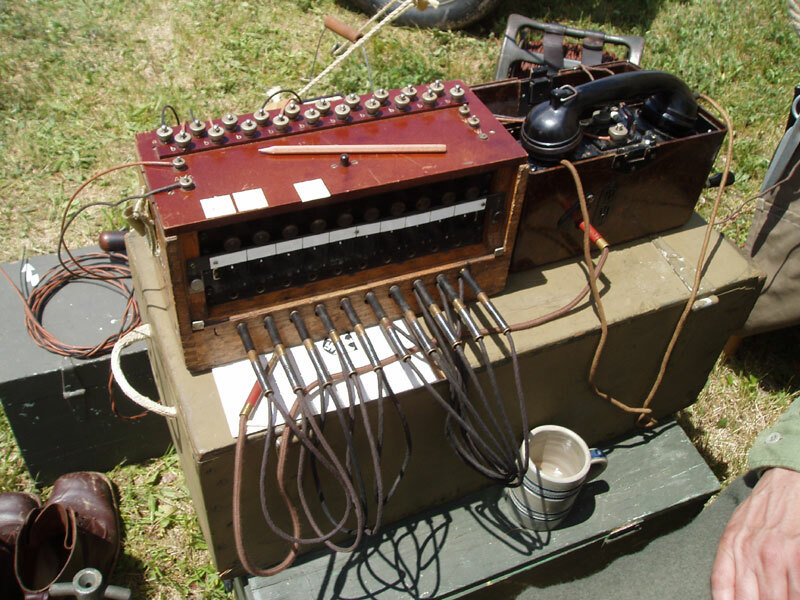 Links to pictures of this unit are here - Telephone and also here - Telephone. 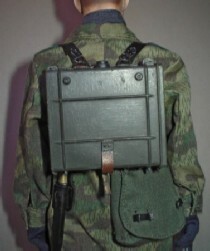 I have just discovered that there are no 'D' ring fittings on the radio backpack from the box, which are used to fit the radio onto the 'Y' strap at the top, also nothing is on the bottom of the radio unit as well, so it cannot be fitted to the auxiliary straps at the bottom. 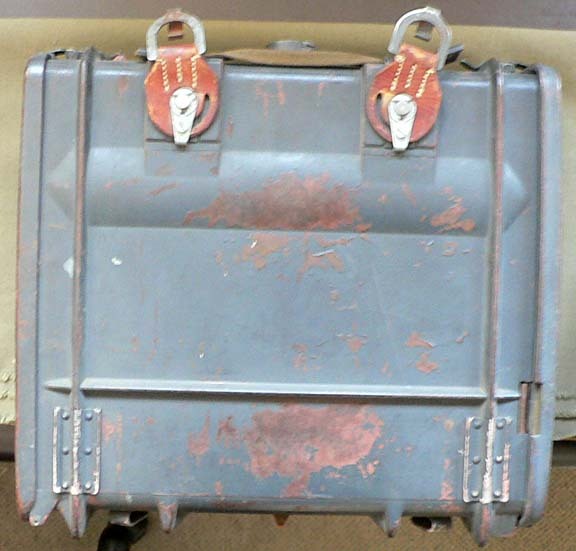 So as this piece came from the box as shown on the right, I have no choice but to try to scratchbuild all of the fittings for this, along with the other 'D' rings I need to be able to fit an 'A' frame to the front of the radio for the zeltbahn and the carry bag. 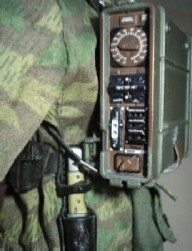 With the help of Rob from the Fieldgear.org, and the pictures above I have been able to make some of the changes that I wanted to do to this radio unit to make it look a bit more realistic. And from these pictures I now have a very good idea about what I have to make, both for the top 'D' rings, the extra leather carry strap and also the bottom leather strap to hold the 'A' frame in place. In the first picture above I have removed the moulded brackets from both the top and the side, and on the top I have used some plastic strip to make new brackets for the 'D' rings. 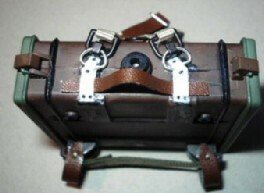 I also raised the 'D' ring mountings slightly so that I could fit a leather carry handle. 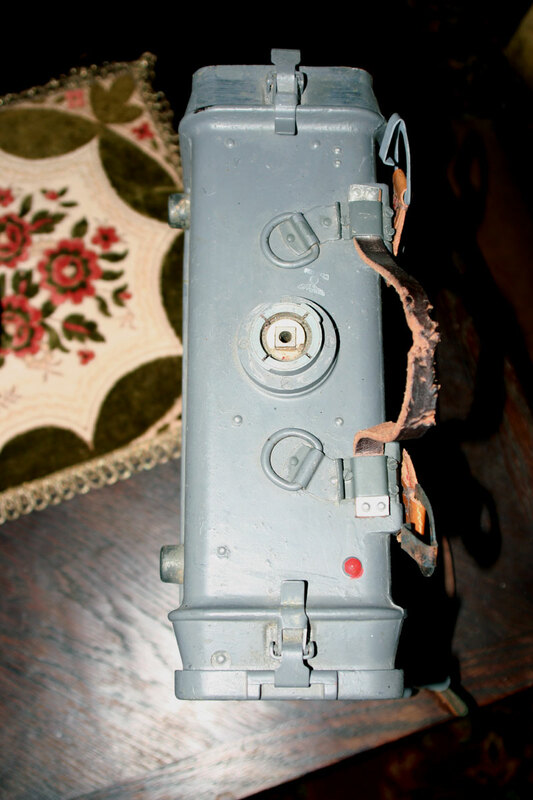 The picture in the middle above is where I have removed the moulded strap at the bottom of the radio unit, and I have used some spare pleather material to make the leather strap that is used to secure an 'A' frame to the front of the radio. 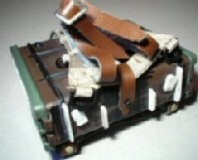 Also underneath I have made a small pip from some stretched sprue, to make the stud that the leather strap fastens to. 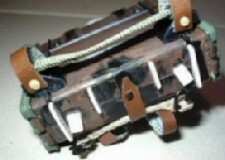 The picture above right shows how I have made two leather straps that go over the waist belt. 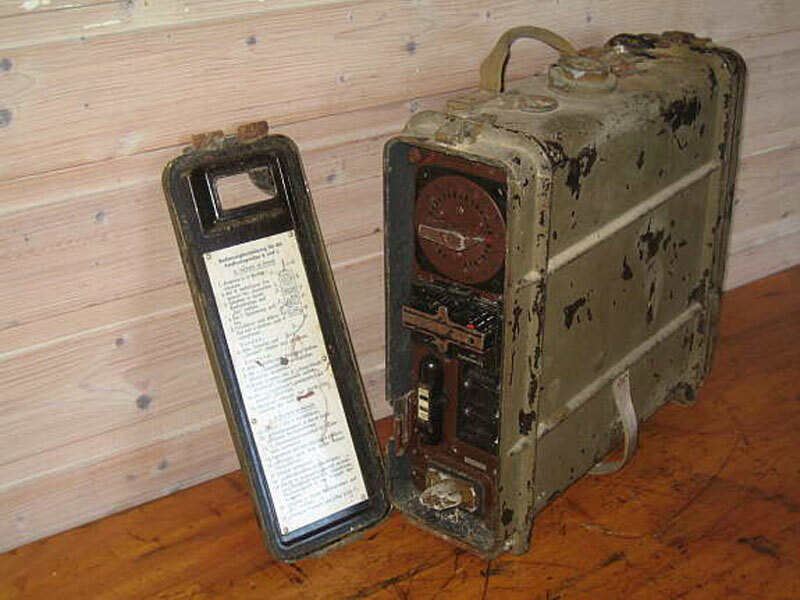 The reference pictures above were very kindly supplied by Per from his very informative website about German and Russian radios. And they have helped immensely with some of the smaller details that I was after. 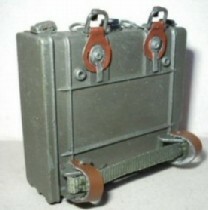 Especially with the main leather top 'Y' strap connectors as shown above right, since they are a major part of the whole radio assembly. 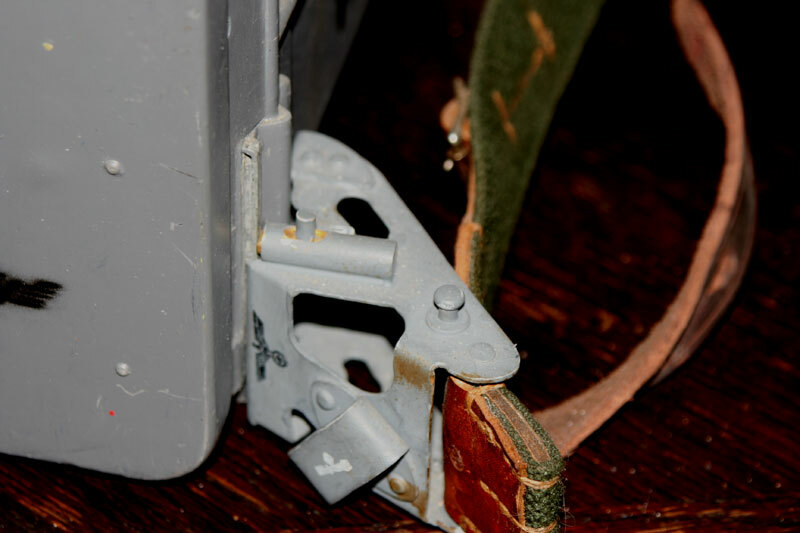 Here I have a close up of one of the waist belt securing straps, with a pin I have made from some stretched sprue which is placed through the strap and then through two holes I made in the bracket, this took about three goes to get right as I wanted a tight fit for the pin, I then glued the top part in place so it would not come out. 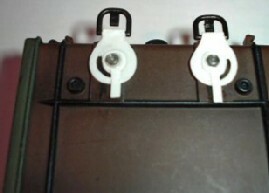 The middle picture shows the stands I made from plastic on the bottom of the radio unit, and also the two brackets so that the 'Y' strap auxiliary strap rings can connect correctly. 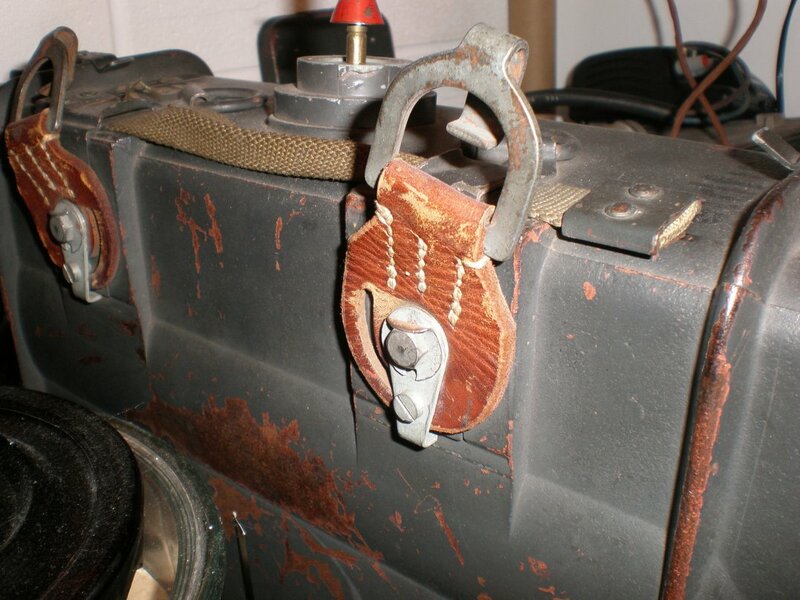 In the picture above right I have test fitted an 'A' frame to the front of the radio, to check that it fits properly on both the top 'D' rings and that the lower centre leather strap holds it in place. 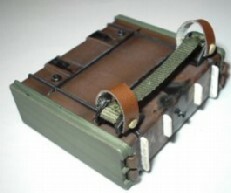 These pictures show the 'A' frame test fitted onto the front of the radio, the waist belt test fitted to see that it goes through the new leather support straps on the radio. 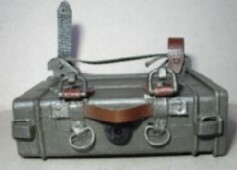 And above right I have scratchbuilt the main top 'Y' strap supports for the radio, I was going to see about making these from some type of leather material, but I decided to use some thin plastic instead because I found that this will be stronger, especially with having to have the clasps fitted to them as well. Plus it would be easier to glue plastic to plastic, rather than leather to plastic. 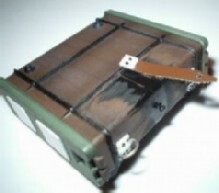 These pictures are of the finished and painted Feldfunksprecher.b radio unit, and to be honest I am still surprised at how it has turned out, since I did at times doubt whether I would actually do this or not. Were it not for the very generous help of both Rob and Per I would still be scratching my head about what it is supposed to look like. With the test fitting of the radio as shown above, I also ran into another small problem with the auxiliary 'Y' straps that I wanted to connect to the bottom of the radio. This was that even when I fully adjusted them, they were still slightly too short to fit properly, so I adjusted them out all the way. 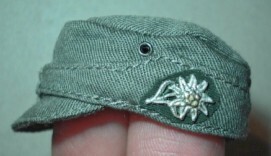 And then sewed the 'D' ring inside a small loop at the end of each of them, I then adjusted the buckle down so I could now connect the straps to the bottom of the radio as shown above right. Two very good reference pictures was sent to me by Rob, and I have shown them here on the right. And it has answered a lot of my questions I had regarding this figure, and if I was getting it right or not. 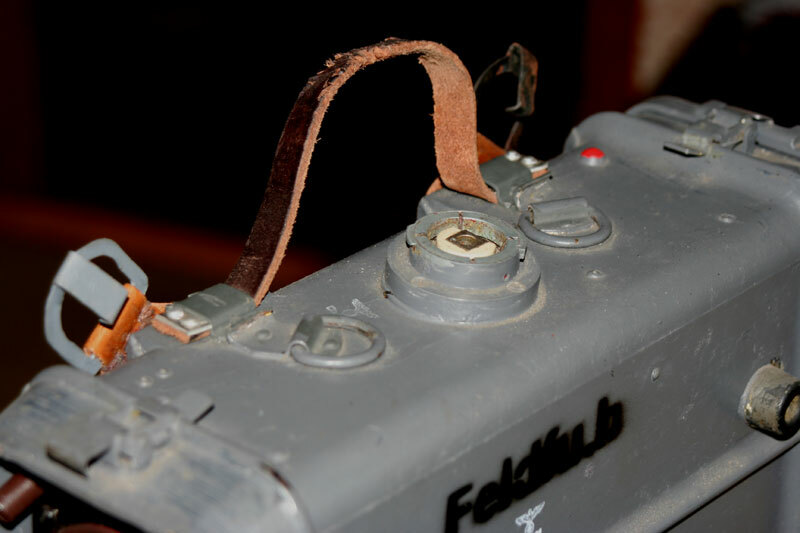 As I did have some doubts raised about whether the leather 'Y' straps were used with this radio, and in these period pictures, it is clear that the straps were indeed used. Also I was also concerned about the size of the shoulder boards on the tunic, and how the 'Y' strap was worn. And for these questions I had some very good help about this on the Sixth Army Forum as well here. 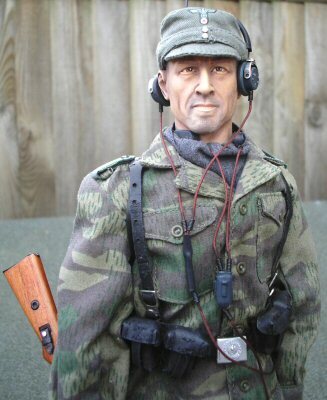 With the pictures below I have finally got the headphones and microphone fitted to the figure, and also connected to the radio unit. I have also fitted an 'A' frame to the front of the radio, this was mainly done to add some extra pieces to the figure as I thought otherwise he looks a bit light on equipment. I also placed the side panel from the radio in between the zeltbahn and the carry bag on the 'A' frame, because I thought that it would have to be carried somewhere. The final part that I have used with this figure is a wooden Soldier Story Kar 98 rifle, and I am surprised at how well it is made. The only alteration that I have done to it is I gave the wood a rub over with some Dark Tan shoe polish, mainly as an experiment to see how the colour would change. I have been corrected on a couple of points with my figure, which I have shown below. 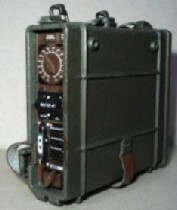 One was the layout of the 'A' frame on the front of the radio, because I had the carry bag and zeltbahn in the wrong place. I have changed this now as shown below and on this page. The second point was that I had forgotten to put on the sleeve badge. 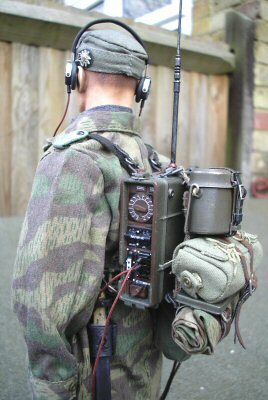 Patrick (Heeresbergführer) for the pictures and the help with my radio figure. Paul (.308) for all of the detailed help with my mistakes when using my paintbrushes. And a thank you goes to Rob from Fieldgear.org for his detailed help and his kind permission to use his images here.